I hope everyone had a wonderful Christmas. I intended to post a Christmas greeting, but was too busy playing with the kids to get on the computer. I did say a Christmas prayer for everyone though and hoped that everyone was counting endless blessings to celebrate Jesus’s birthday. We did Christmas differently this year, to give Beth a bit of a break. We celebrated Christmas Eve on Sunday, with our family, who we typically would have seen on Monday. Then Monday we stayed home and kept it a low-key day as her body tried to regulate back to its normal state. Tuesday we had a wonderful Christmas morning at home playing with some of the girls’ gifts. They even ate breakfast in their new wagon, Big Red. In the afternoon we headed to my folks for a small family dinner and the girls had the extra treat of spending the night, while Henry and I enjoyed an impromptu date night. We went to the movies at our favorite theater, which serves food and adult beverages, to see The Hobbit, and it was AWESOME! We came home to a quiet house and had a real night’s sleep to prepare for the coming days. All in all, the holiday celebrations went well and were quite enjoyable, even though we greatly missed family that could not join us due to illness and scheduling conflicts. As long as everyone is healthy and Beth is up to it, we will be doing Christmas all over again on New Year’s Day with my in-laws, who were trapped in bed with bad sinus infections this holiday season. So now that Christmas is over it is time for the next big event in our life. Beth is having surgery tomorrow to remove her tonsils and adenoids. She has had what we call the “mystery cough” at night, for almost a year now, which not only wakes her up, but keeps Anne from sleeping as well. After trying every possible treatment, we finally saw an ENT right after Thanksgiving. The doctor is Au-Some and was actually able to look in her mouth, without her melting down or vomiting all over. God bless the man, he even crawled around on the floor with her, to conduct the full exam. We decided to wait until winter break to have the surgery, so she would not miss school. Unfortunately this plan backfired and she had a horrible virus which caused her to miss the last 2 weeks of school. Thankfully her teacher is AMAZING and sent us get well pictures with all her friends. At the moment Anne is at my parents’ house, and will be vacationing in the Land of Spoiled for a few days while we focus on Beth. We are to arrive at the hospital at 6am for a 7:30am surgery. If all goes well, and we have the best case scenario, she will be home recovering by the afternoon with lots of cuddles from mommy and daddy. If things do not go as we hope, then she will be admitted to keep her hydrated and manage her pain. We are preparing for the worst, but praying for the best. Fortunately she has quite a high pain tolerance, so as long as we can get her to drink fluids, then I think we can handle recovery at home. Henry is a nervous wreck, and there really is no comforting him until all is said and done. I am strangely comfortable with it, and I know I owe that to Al-Anon and my program. I have turned it over to God, and I am confident that everything will unfold as it is meant to, and I know she is going to do great, and will be so much better for having the surgery. I am also very excited at the prospect of being able to remove at least 3-4 medicines/supplements from her regiment, after she recovers from her surgery. 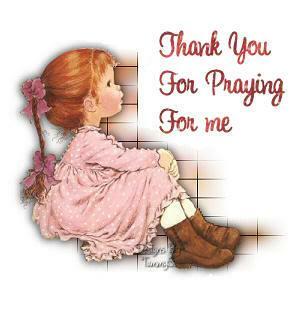 If you are inclined to pray, I would ask that you please keep Beth in your prayers during the coming days. We are praying for a successful surgery, followed by a quick and manageable recovery at home, because she has spent far too much time in the hospital already this year. I may not be around for a while, but I welcome the feeling of your prayers holding us tight in loving hugs tomorrow and in the days to follow. Something AMAZING happened to me tonight, I met an Angel in the parking lot at Walmart. We have had a rough few weeks, with Beth being sick and life in general not going as planned. As hard as I have been trying to work my program, I find myself still struggling lately, and I had a horrible case of the blahs today. Although I had finished my Christmas shopping early, I had not stocked up on the household essentials and had to go shopping to get much needed supplies for the girls. So off I went with my sad self, short on patience and cranky because I had to go out in the madness that is holiday shopping 3 days before Christmas. 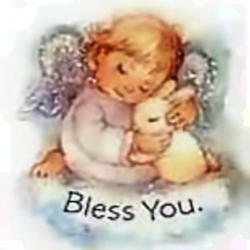 Traffic was horrible, but I put in my ‘Mercy Me’ cd and let the music take me over, soon I was feeling better. Perhaps it was just being out of the house without any sick, whiny children. I love my children but after 2 weeks of being in quarantine with Beth, I am kind of losing my mind. Plus Anne has hit the terrible two’s just a wee bit early, and sometimes I feel like I am living with two teenagers instead of two kids under age 4. I finally arrived at my first destination, Fashion bug, which is having a going-out-of-business sale. My wonderful mother-in-law, who knows me all to well, told me I was getting money for Christmas, but I HAD to use it to buy myself clothes, and that I could get more bang for my buck since everything was at least 60% off. Well I spent 1.5hours shopping for me and actually spent all the money on ME, which is not easy considering there is ALWAYS something I can buy for the kids or a bill to pay. Normally I would feel guilty but I was actually happy and excited about my purchase, and had to call momma right away to thank her for making me take care of myself. When I turned around there was a woman standing next to me, I still am not quite sure where she came from, but there she was. She walked past me, and I quickly went back to the van, got in and locked the doors. I honestly did not know what to think about what just happened, and feared it may be some kind of scam. 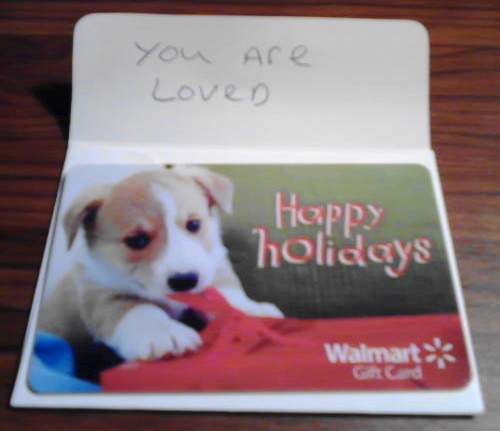 I sat for a moment listening to the music, which was one of my favorite songs, Beautiful by Mercy Me, then I looked at/in the envelope and there it was: The woman, who had disappeared as quickly as she had appeared, had given me a $25 gift card for Walmart. The outside said: “For Someone Special” and the inside, as shown above, said: “You Are Loved.” I looked for her in the parking lot, but she was gone; so I just sat there all tingly (the good, did that really happen, chills), crying and saying Thank You to the night sky. I have NEVER had anything like this ever happen to me, and hours later, still cannot believe that it really happened. On a day when I really needed something to snap me out my funk, God sent me an Angel to remind me of all the miracles and blessings in the world. I am grateful for the financial help, but I am even more thankful for the spiritual help. A simple act of kindness and generosity from a stranger, has given me the BEST Christmas gift of all, for the lady with the red hair and leather jacket reminded me what life is really about, and how it truly is better to give than receive. Thank You beautiful Angel! I received the message loud and clear, there is still so much good in the world, that I cannot be deterred by the struggles. I will be eternally grateful for your loving kindness and promise to pay it forward, as best I can. May we all grow this holiday season through Hope, Love and Faith. God Bless!